Infibeam, the flourishing e-store, has inculcated the international brand Wrangler in its Lifestyle collection. The limited range of Wrangler men's apparels, which is available at up to 20% Off, is likely to expand further soon. The leading e-commerce and e-commerce solution company, has got yet another fashion brand in its kitty. Seven-decade old American brand, Wrangler has introduced its wide range of jeans, t-shirts and casual shirts on the popular online retail store. At present, the portal offers men's clothing with a discount of up to 20%. Wrangler is popular for men's denims and the comfort and style they provide. 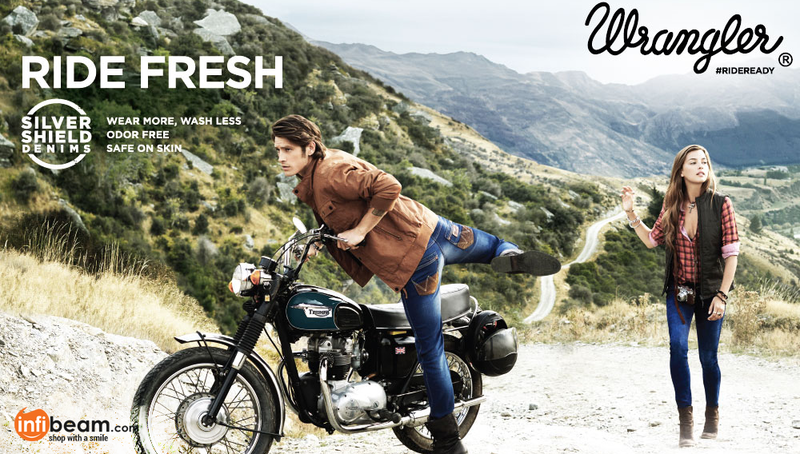 On Infibeam, Wrangler has come up with a range of new colours and shades of jeans in black and blue. The jeans are being made available in different sizes, and the price starts from Rs.1,800 to over Rs.3,500 per pair. This new range aims to caters to the niche segment. With time, the catalogue of Wrangler on Infibeam will increase. At present, one can find cool v-neck and polo t-shirts in various solid colours and stripes. The price range of the t-shirts in different sizes varies between Rs.700 and Rs.1,700. The catalogue also includes casual cotton shirts in dark and vibrant shades to make men look dashing and rugged. Wrangler offers shirts in checks prints and solid colours, in different sizes, and in the price range of Rs.1,700 to Rs.2,100. Initially, only men's clothing was listed in Infibeam's Wrangler category. But, since Lifestyle is one of the fastest growing categories on Infibeam, very soon Wrangler would expand its catalogue by adding women's clothing, accessories and other items as well. The lifestyle category of Infibeam already offers clothings from various brands such as Adventure, Afford, Amaira, American Bull, Axsglow, Benneton, Bombay High, Daniel Hechter, Ferrous, Focker, Freecultr, Good Karma, Indigo Nation, Le Bison, Msd, New Port, Numero Uno, Slub, Stylox, Zoiro and many others. The addition of Wrangler to the collection is definitely going to boost the desirability of Infibeam as a whole. Grab your favourite Wrangler apparels at up to 20% Off and flaunt your own style statement.